Tourism and offshore banking are the mainstays of the small open Aruban economy. Oil refining and storage ended in 2009. The rapid growth of the tourism sector over the last decade has resulted in a substantial expansion of other activities. Over 1.5 million tourists per year visit Aruba with 75% of those from the U.S.
Construction continues to boom with hotel capacity five times the 1985 level. Tourist arrivals rebounded strongly following a dip after the 11 September 2001 attacks. Aruba is heavily dependent on imports and is making efforts to expand exports to achieve a more desirable trade balance. The government has also made cutting the budget and international development high priorities. Labor force: 51,610. Most employment is in wholesale and retail trade and repair, followed by hotels and restaurants. Export commodities: Live animals and animal products, art and collectibles, machinery and electrical equipment, and transport equipment. Import commodities: Machinery and electrical equipment, crude oil for refining and re-export, chemicals, and foodstuffs. Learn more about Aruba and other countries in our daily postcard e-letter. 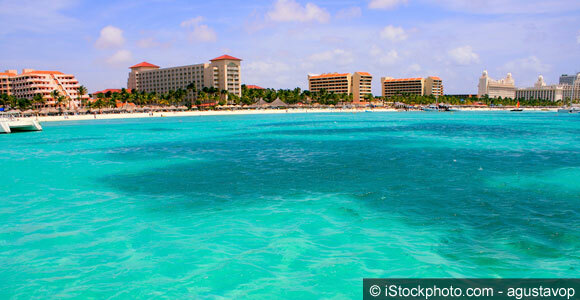 Simply enter your email address below and we’ll send you a FREE REPORT - A Taste of Aruba.